Tulsa Wedding Venues | Glam Up Your Bridal Shower! Glam Up Your Bridal Shower! If your Tulsa Wedding venues is already booked, you are ready to start planning your wedding details AND your Bridal Shower! Your Bridal Shower should be one of the highlights of your whole wedding prep process. And with your Tulsa wedding venues already picked out, you will be ready for a little celebration! 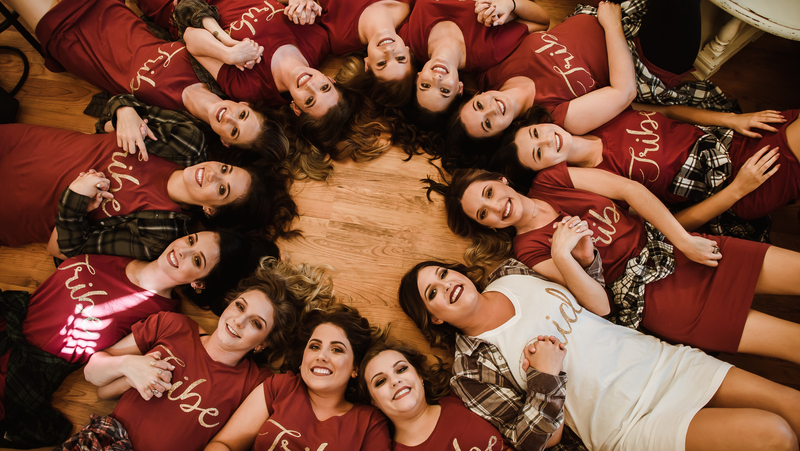 It’s so much fun to get together with all of your gal pals and celebrate YOU! But there are so many fun things to think about including in your bridal shower. Let’s look at a few great and creative ideas for food and beverages! A Bellini bar is a wonderful add-on to any event. So whether you’re hosting a wedding reception, party, or a Bridal Shower, a Bellini bar is the perfect addition to any occasion. That’s why Gifts.com has put together an easy-to-follow guide on creating a homemade Bellini bar. The guide includes the essential ingredients needed, styling tips, and a sugaring station for guests with a sweet tooth. 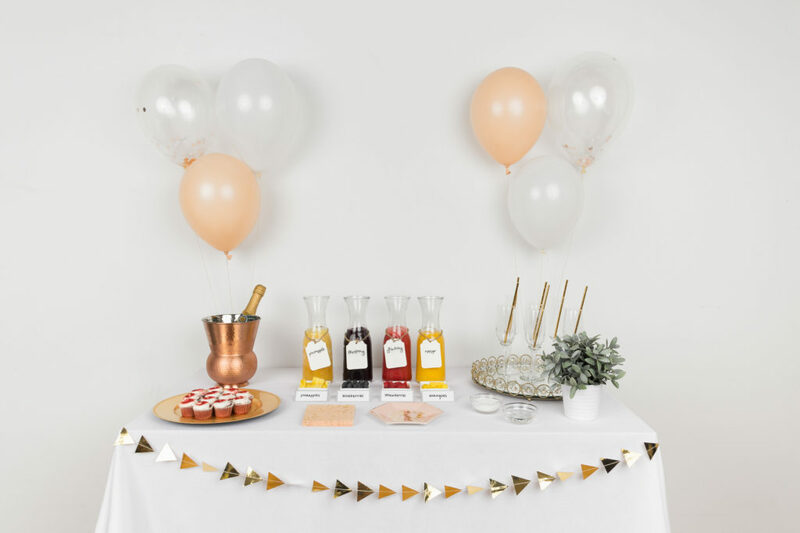 Get even more creative and create your bar with a unique wall backdrop such as balloons or paper garland and set a few varieties of fruit purees on the table. Then make sure your champagne is chilled, and serve in a buffet style or pre-make your Bellinis for guests to enjoy. Top it off with beautiful stemware and you will have a bellini bar to remember! We all know that the donut has taken on a new life at parties and receptions, but let’s not leave out its cousin, the Bagel! Though the bagel may not be as glamorous as the donut, it certainly has a lot to offer! It’s perfect for a brunch time bridal shower because it is a great alternative to sugary sweet breakfast items. And the bagel can be topped with so many great things: cream cheese, butter, peanut butter, jellies, jams, etc.! The bagel is also very versatile and can be the beginnings of a great sandwich. So be sure and have some sliced cheese and lunch meat at the ready for those that want a more “meaty” meal. 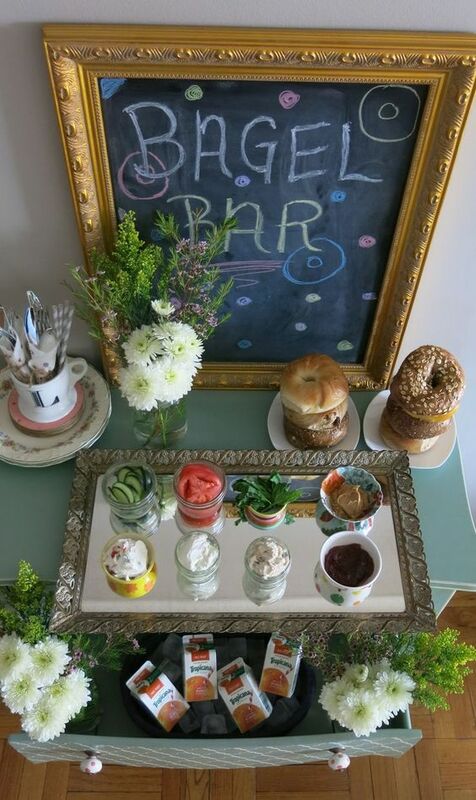 You can borrow some great ideas from the donut bar to display the bagels. Check out this link on displaying donuts and convert it displaying and serving your bagels! Glam it up with some beautiful china or sleek glass brunch plates to really make a statement! If you decide not to include this in your bridal shower, it’s also a great idea for your reception at your chosen Tulsa wedding venues! You have the fantastic Bellini bar and the amazing bagel station, now let’s add some sugary sweet treats to this get-together! So many ways you can go in this area, let’s just look at a few. Have all your friends chip in on this one and decide on a dessert theme. How about a candy bar! Have everyone bring their favorite candy in their most creative service dish and have an eclectic candy bar. Or get kooky with cookies and everyone can bring a dozen of their specially made cookies! Again, specify to bring them on a special serving dish that makes a statement. The beauty of this idea is that it spreads out the burden and gets everyone involved. With preparing for the shower in so many other areas, it’s nice to have one area where you can count on everyone to chip in! ⟵Let Your Style Reflect You!